This chambered electric guitar body is a sandwich of a Maple, Walnut & African Mahogany. 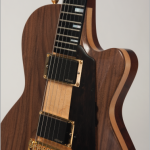 The African Mahogany neck is carved into the back without a heel, allowing easy playability to the highest frets. The top and headstock are highly figured Maple and Walnut. 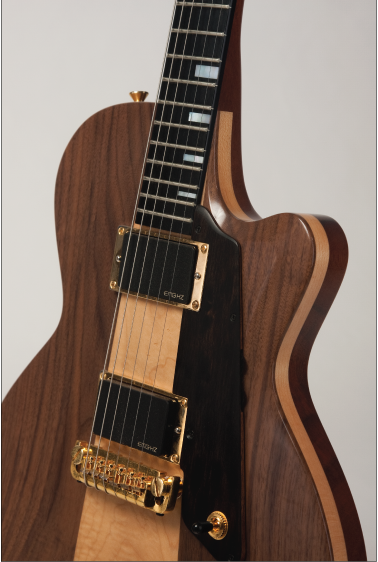 The fret board is Ebony with a Mother of Pearl “Letain” signature inlay. The pickups are EMG Humbuckers, that are wired in the Les Paul style. The thumb wheel volume controls and pickup selector switch are subtly mounted in an ebony pick guard. The machine heads, bridge and strap buttons are gold. The finish is nitro-cellulose lacquer.